It says a lot about Simon Rogan that, in his mind, one of the greatest things he has ever been involved in is installing his farm’s closed-loop waste management system. This is a chef who, at the time of writing, owns three restaurants, and two Michelin stars. L’Enclume, his flagship restaurant up in the rugged wilds of the Lake District, has become a destination, globally renowned both for its culinary creativity and because 95 per cent of its ingredients hail from the pristine farm on which it’s located. “We’ve achieved a lot and we’re very thankful, but we’ve worked our butts off,” Simon tells me over a builder’s brew at the back of Roganic, his Marylebone outpost. His wife and business partner Penny, working at a nearby table, pricks up her ears. “We still do,” she exclaims, and Simon grins. It made for a turbulent beginning: “There is even more competition in London these days, and ‘dry veganuary’ is tough on restaurants.” Meanwhile, up north, the Beast from the East, Brexit and elections were creating a perfect storm both for the farm, and for L’Enclume’s reservations. 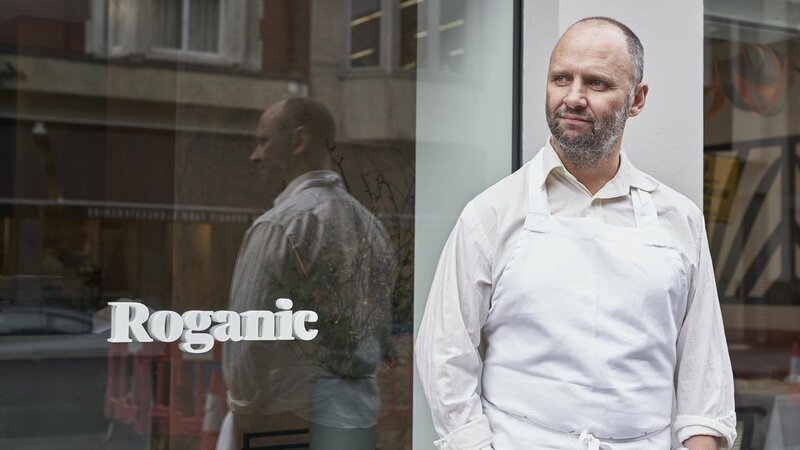 Yet after eight years of hoping for his return to the area, food-lovers of Marylebone greeted Simon Rogan’s new venture with open arms. Stepping away from this smokescreen has focused Simon’s attention on the farm and creating, from scratch, the finest, most flavoursome ingredients around. His are not vegetarian restaurants, but they do want to serve the sort of vegetable dishes that don’t leave you asking where the meat is—and when they do meat, they want it to be organically reared in the most ethical, sustainable way possible. Producing meat in a more sustainable fashion is just one part of the equation: in the past, farm animals would have been fed kitchen scraps and trimmings, not crops eligible for human consumption. The other, of course, is to produce less meat—a lot less—and elevate vegetables from their current role as support acts, to main events. They found an organic farm up the road and asked them to grow “forgotten herbs: hyssop, sweet cicely, woodruff and good king henry. I found them in old seed catalogues and looked up how to grow them,” he tells me. The farming proper didn’t commence until some years later, when the farm came up for sale. Frustrated by the quality of vegetables in the area, Simon looked into growing radishes there—“the simplest things, and yet we couldn’t find a decent one to buy.” The rest is history—and a pioneering model for the future of farming and chefing. Simon talks a lot about “simple” food; about the innate value of good produce and having no more than three ingredients on a plate. His dishes belie this. Not that they’re complex—plump, verdant asparagus basted in bone marrow, nestled alongside a dipping pool of homemade hollandaise and leek ash is hardly Heston—but there is, he explains, “a lot that goes into those three ingredients. Often a simple plate of food has a long story.” The sauce might have been made on a rotary evaporator. The oil could have been spun on a centrifuge. He might be green-fingered in the garden, but Simon is no ingénue when it comes to cooking gadgets: his development kitchen, located next to L’Enclume, is home to some of the world’s most cutting-edge equipment. “There’s a huge amount of work that goes into the preparation, but we do things to help the flavour along rather than change it—using low temperatures, avoiding unhealthy techniques, and keeping things as natural as possible.” So, the carrot puree quenelle served alongside the aged Cumbrian pork, so deeply orange and so profoundly, well, carroty was…? “Carrot cooked in carrot juice,” he smiles. “That’s a bit of an obvious one. Of course, a carrot cooked in carrot juice will have more flavour.” Yet when you’ve carrots as good as the carrots L’Enclume and Roganic have at their disposal, runs the argument, why do anything else? Somewhat ironically, given the intensity of both their flavour and my memory of them, carrots are the hardest things to grow on Simon’s farm: “They always seem to be eaten by something—carrot fly, usually.” Saffron, wineberries, elkhorn fern, atsina cress snow and buckshorn plantain? No problem. Carrots? Absolute nightmare. Fortunately, Simon’s a patient man. From that moment, the world was his native oyster, delicately crowned with shivering trout roe and piquant pink leaves—another treat on the 17-strong tasting menu. He’s travelled thirstily ever since: the past six months have seen him popping up, cooking and lecturing in Manilla, Greece, Singapore and Hong Kong. With each country he visits, he brings back new seed varieties for his polytunnels. “I’ll try anything. We’re looking at moringa, vanilla and hemp seeds, and we’ve started growing wasabi.” While his trips abroad and to London continue to sow seeds in his mind as well as his farm, he is “always ready to get back among the sheep and the cows”—to the place where his “simple is beautiful” ethos entirely surrounds him. As I leave Simon preparing to set off back to Cumbria, his first weekend off in a month, I get the same impression as I did weeks previously, rolling out of Roganic after 17 courses, complete with paper bags of scones and tea for the morning: that with his return to Marylebone, Simon has closed the circle, and come of age.